Heartfelt Industries is a provider of the Perfect Humidor Humidity Source. Small 65% Rh (BLUE Cap) Heartfelt Humidity Tube Discounts Apply ! The new tube allows for much better transfer of humidity to your cigars. We offer a Small Humi-Tube of Heartfelt Beads. 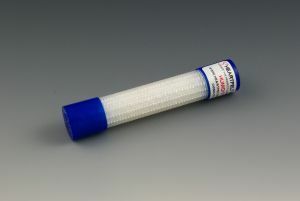 This tube will control the humidity in a humidor up to 270 cubic inches. Important: You can use more Heartfelt Beads in your humidor than the minumum amount recommended. The additional Heartfelt Beads will give you more moisture storage and help the humidor recover quicker when it has been opened. The extra Heartfelt Beads will also help compensate for seasonal changes and a less than perfect seal on your humidor. Size: 4 1/4" long by 3/4" in diameter. Please Sign up for our Newsletter. Click here to Subscribe. Copyright © 2001-18 Heartfelt Industries Inc.